The Australian Health Policy Collaboration has just published the Australian Health Tracker Report 2016. * This first national health report card is a welcome addition to the debate on health service needs. As an example, the report puts the national average for Diabetes at 4.7% for the 25-65 age group and rising. To plot this against the Primary Health Network regions of NSW (PHN) delivers an interesting and concerning result. 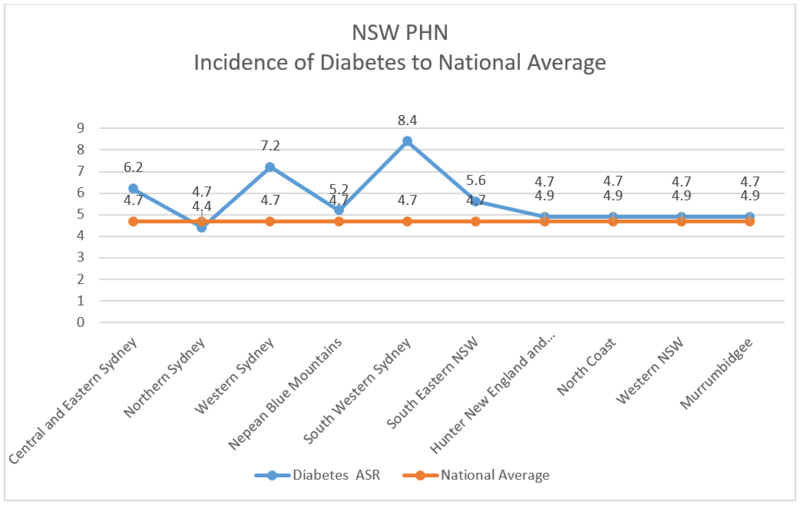 If this data is mapped for the PHNs, it clearly highlights the same elevated incidence in a number of PHN Regions, but it is a very blunt tool delivering no further information for decision makers or information for improved health outcomes within communities. Imagine if the PHN or Local Health Network could drill down and understand where the priority suburbs are located, and then allocate the valued Health budget to begin an effective process toward real community outcomes. 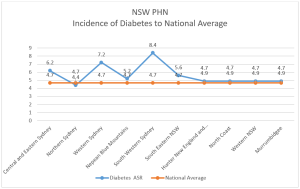 So let’s take the South Western Sydney PHN region as an example, where in the graph above diabetes is identified at almost twice the national average. At Cogent we have been working on a big data analysis methodology which allows us to drill down further, reducing big data into manageable population numbers for effective and efficient analysis and consequent allocation of funding against clear strategic health objectives. 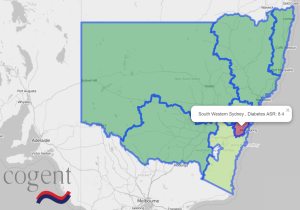 Here is the same South Sydney PHN now mapped against smaller Population Heath Areas (PHAs). Gone is the LGA (Local Government Area) based analysis, though this could just as easily be mapped against the SA3 ABS regions or LGAs. 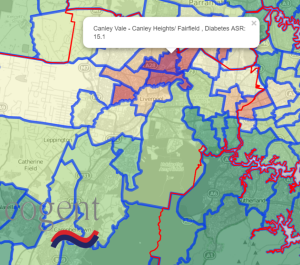 Our analysis can be translated to a map of the PHN (red boundary line) showing a cluster of PHA regions centred on Canley Vale and Fairfield with an ASR** of over 15 per 100 incidence of diabetes against the national average of 4.7. With our analysis, the PHN can now develop targeted localised responses with a validated argument for additional funding utilising an established benchmark, rather than spending scarce funds across all of its region. 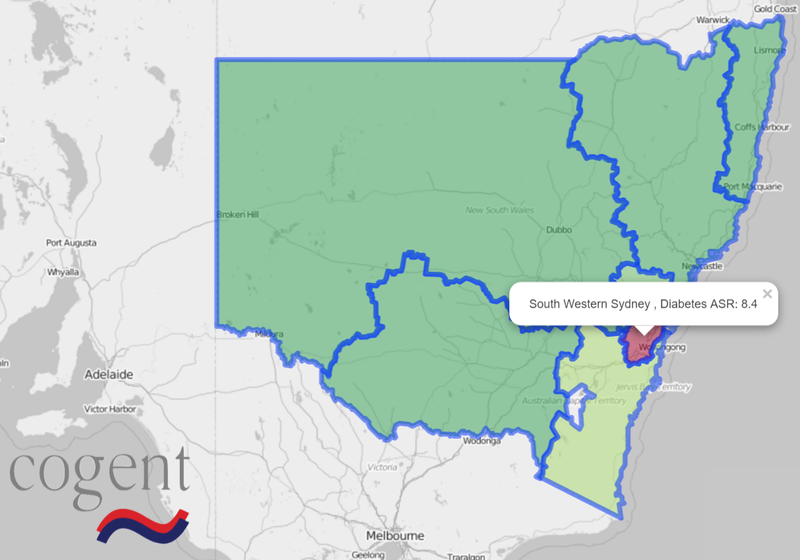 The analysis method we have developed can further cross correlate this localised instance of diabetes against other health indicators, such as obesity or alcohol-use: utilising the entire PHA set of regions in NSW. This allows for a more efficient and effective use of collaborative strategies to address health issues at a localised level within each PHN: by ruling in or out other instances of health with associated suspicion, the decision maker can instantly focus their programs. The methodology developed to date can further use advanced machine learning and artificial intelligence tools to develop optimisation, thereby allowing for the development of specific strategic responses such as the placing of GP Clinics or GP Registrars, or the placing of mobile Cancer Screening facilities in the areas of highest need. With a National Diabetes Target of 4.1% by 2025, the use of big data analytics with immediacy and localised relevance promises powerful opportunities for Health decision makers to target programs and focus health strategies so they achieve the most effective health outcomes for the Australian Community. If you’re interested in developments in this area, or utilising this capability in future we’d be happy to keep you upto date. Just provide your email by clicking here.